France, 1976, 82 minutes, Colour. Directed by Rene Goscinny, Albert Uderzo. 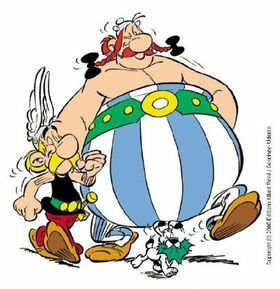 The first animated films of the Asterix comic strips appeared in the 1960s including Asterix the Gaul and Asterix and Cleopatra. This film appeared in the mid-70s and there were various other films from the strips. In the 1990s, there was an attempt to have live action films of Asterix starring Gerard Depardieu and Monica Belucci. These films are for those who have enjoyed the comic strips, enjoy the parody of the Roman empire, in this film Julius Caesar and Brutus, and the response of the Gauls to the invasions by the Romans. While funny in themselves, they also make comment on contemporary society – human and social foibles. 1. For what audience was this made? French, non-French? Adults, children? 2. The quality of the animation, the detail of the drawing, the humorous caricature? Colour, music, Rome and Gaul and their settings? The ancient history atmosphere, mythological atmosphere? The continual inferences about the Twentieth Century? 3. The humour of the characters, the satire In their names? How real was the humour? 4. How well did the film use ancient history, well-known characters and plots? An adaptation to satire on modern situations? 5. The creation of the village, its look, the people, their resistance against the Romans, their heroes, the magician and his magic power, its effect, their capacity for repelling the Gauls etc.? A commentary on small powers resisting the great? 6. The way Caesar was drawn? Audience response to the tradition of Caesar? His impact on the Gauls, on the Senate, the satire with Brutus and his knife, his plans, his visit, the irony of his final defeat? The insight into the arrogant man? 7. What kind of hero was Asterix? The genial personality, small and modest, yet achieving? The humour in Obelix as hero? Fat but succeeding? 8. How strong was the satire in the 'meek secretary' type in the portrayal of Tidilus? 9. The structure of the twelve tasks, the background of Hercules, the Herculean tasks for these heroes? The visual excitement, humour? The atmosphere of adventure, suspense? The sense of achievement? 10. How important was the parody e.g. the bureaucracy and the house where people went mad, the pleasure island and the women there and their irritation with Asterix, Obelix and his eating, the false monsters of the dark, the satire on the ghost train and the sideshow? The climbing of the mountain, the riddle of the old man and his soap commercial? The throwing of javelins, their running, the ghosts? 11. The humour of the Gauls conquering Rome and the irony of the ending with Caesar as retired? 12. How enjoyable were the ingredients in this animated film? Why? Its reliance on history, attitudes in the modern world, human nature?